Fergola is a Sardinian semolina pasta available from select delicatessens and grocers. If it's unavailable, substitute for another small pasta or pearl couscous. Combine KNORR Professional Mixed Peppercorn Puree, thyme and oil together. Clean and trim the lamb rack to remove excess fat. Cut into cutlets and seal. Cover with pepper corn and thyme mixture and oven bake until cooked to desired liking. Place tomatoes directly on a char grill and cook until skin is blackened. Set aside to cool. Peel, lightly crush. Cook fergola in boiling salted water until tender (12-14 minutes). Drain well, and then spread on an oven tray to cool and dry. Transfer to a large bowl combine with tomatoes and their pan juices, vinegar and oregano and KNORR Professional Garlic Puree, mix well. 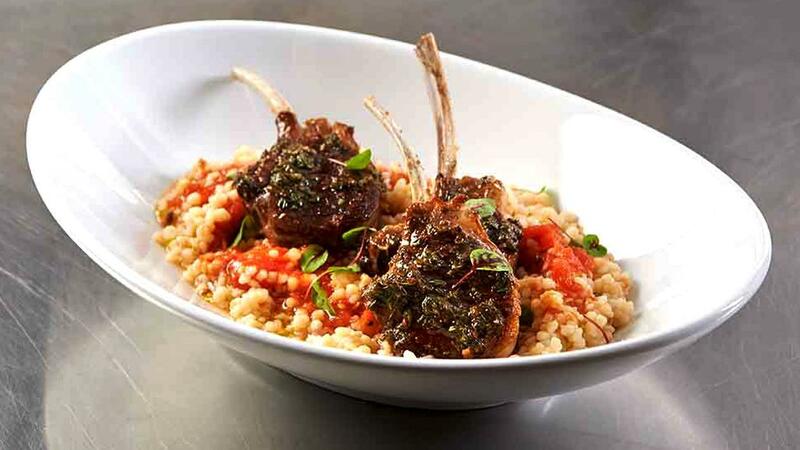 To serve place fergola and tomato mix on a plate with the lamb.